Successfully Added Deluxe HD Camcorder with 3 Inch Touchscreen + 60FPS to your Shopping Cart. 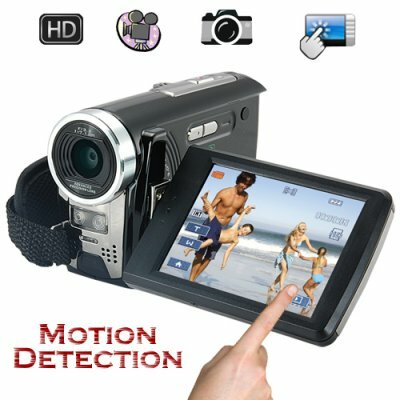 Stylish HD camcorder with motion detection and a 3 inch LCD touch screen. From video recording to image capturing. This beautifully well designed digital camcorder is built to perform effortlessly. Coming with two SD card slot that each handles up to a mammoth of 16GB each, giving you a total of 32GB to record hours of video, and capture thousands of photos all in crisp quality image. The 3 inch LCD touchscreen makes operating this camcorder simple. With one mode touch select either video recording, photo capturing or voice recording. Never miss a moment thanks to its quick response and effortless performance. With the ability to take H.264 video (MOV) at up to 60 frames per second (60 FPS) and a professional grade lens + image sensor, this model will make you want to quit your job and become a Hollywood movie director! From the easy to use button layout and the beautiful 3" viewing screen, to the on-the-fly expandability with SD memory cards, everything has been designed with maximum end user ease and convenience in mind. The 1080P HD video camera works great as both a video and still picture camera and comes as a kit with just about everything you need to get started; Camcorder, camera bag, battery, charger, software, and all required cables included. You just need to add your own SD memory card (up to 16 GB's) and you are ready to start shooting in HD brilliance. With the included macro feature, take super close of your desire objects and see the amazing brilliance in clarity. This is a great HD digital video camera is in stock now and available to you at an amazing factory direct wholesale price, straight form the leaders in digital wholesale electronics, Chinavasion. media Card Supported: SD card and SDHC card Supported. While Recording, when one SD reaches maximum capacity, will the camera automatically continue to record on the second SD card? Can I use the DV18 with a standard tripod,? Yes you can, located at the bottom of this HD camcorder, is a standard tripod screw insert. on 2010-10-09 20:53:12 Fantastic product at an affordable price. Long battery life. Very crisp and clear picture. Kudos to your site. I will definitely return and purchase another one of your products. You also have fast delivery service. This product arrived two days after I ordered it last September 25, 2010. Very compact videocamera. I had it running within a few minutes. The manual was also a godsend! This is the first time that I have a read an EXCELLENT manual written and translated by a Chinese manufacturer. I am having a grand time with this product. Thank you once again. I own this thing and I love it! Simple to use and upload videos, and takes surprisingly good still shots. I am really enjoying using this camera to capture the great moments of my little monkey as he grows up and I am proud to carry this product on my own website.